Some of the best shows are located in and around Orlando! We have just about any kind of show variety that you could ask for from comedy, murder mysteries, animal shows and more. Having a website and living in Orlando has given me the opportunity to see and review a lot of these shows. Luckily, I had the chance to go last week to Universal Orlando Resort to review the Blue Man Group at City Walk! Let’s look into the Blue Man Group, some details about the show, and what we thought! 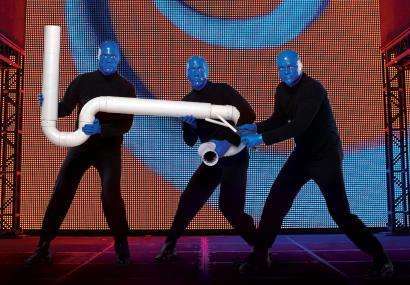 The Blue Man Group is a group of 3 guys who put on a music/comedy show unlike anything you have ever seen before. Why are they called the Blue Man Group you ask? Well these guys all have blue heads!!! Something else fun about this group is that they do not talk! 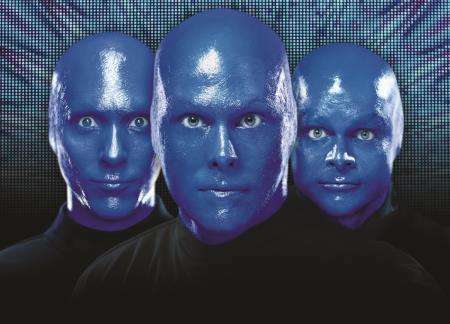 Blue Man Group was founded in 1987 and has been taking over the entertainment world by storm ever since! 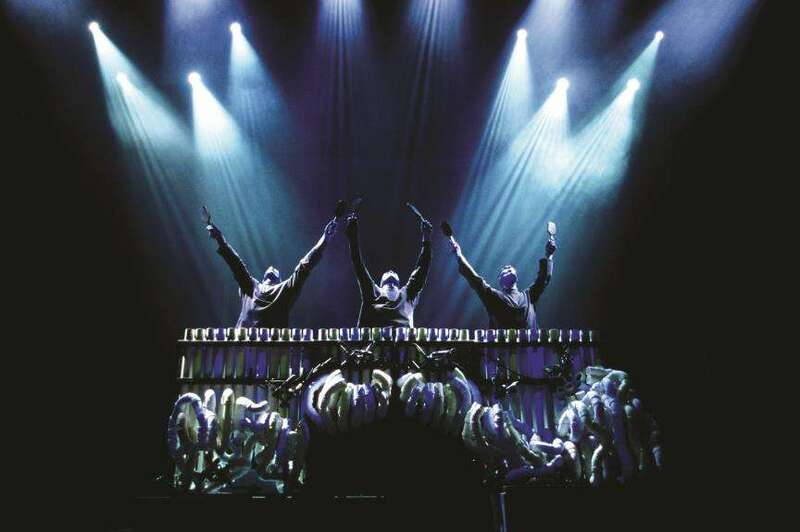 Blue Man Group is currently performed in Boston, Las Vegas, Berlin, New York, Chicago, Orlando, and a touring group. The Blue Man Group show moved into Universal City Walk in 2006 into the Blue Man Group Theater. The theater is located in the old home of Nickelodeon Studios between Universal Studios and Islands of Adventure. This theater plays home to the Blue Man Group nightly (and sometimes more than one show a night) and has state of the art sound, video, special effects and a great lobby with snacks, drinks and alcohol, and a gift shop to buy some really cool merchandise! Up stairs at the theater is the Blue Man Group VIP area which allows a nice area to grab some free drinks before and after the show, as well as a private meet and greet with the Blue Man Group members! Now for the show! This show cannot really be described in words, but I will try my best. This show combines live music, comedy, art, tricks, top of the line multimedia, an upbeat soundtrack, and three guys that will keep you guessing and at the edge of your seat for the entire hour and a half! There are different “acts” that have come from previous shows as well as some that are strictly for the show here in Orlando. Some of my favorite acts were the marshmallow and paintball act that combines art and humor together for the enjoyment of the crowd. I also loved the Gi-Pad act that mixed a great soundtrack, humor and a ton of special effects flawlessly to showcase the talent of these men! Musically, this group uses everyday items such as PVC pipes and steel barrels to make some amazing music. They are also known for their use of paint in the shows (which is why the first few rows are given panchos)! They also mix a great bit of humor into their music which we absolutely loved! This show also has a ton of audience participation. The Blue Man Group men will come out into the crowd to help them with acts, comedy breaks, and yes to give them some great pieces of art such as the paintball art piece created in the show! (I will say that I really would love to be picked for the artwork one day! I love how creative these guys really are!) This show really engages the entire audience as well by using visual effects and top of the line multimedia to keep the people engaged and laughing the entire show. To learn more about this show including dates that the show is going on, times, directions, pricing and to order tickets click here to be taken to the Blue Man Group site here in Orlando! If you want to see if Blue Man Group is coming to a city near you on their tour click here as well! Overall, I absolutely loved this show. It is now my favorite show here in Orlando and I know I cannot wait to get back to see the show again as they are updating the show with new acts regularly! The Blue Man Group keeps you on your toes guessing what they will do next while making you wonder just exactly what you are seeing! Never have I been to a show where I was as disappointed the show was over! These guys kept me laughing and excited the entire time! I highly recommend this show to anyone who wants to have a great time and laugh the whole time! Make sure you stick around the lobby after the show to get some pictures with the Blue Man Group as well as the band! Orlando Fun and Food will be posting another article soon with some exclusive photos of the theater, stage and more as well as welcoming some of the team members of the Blue Man Group to the Orlando Fun and Food Podcast soon! 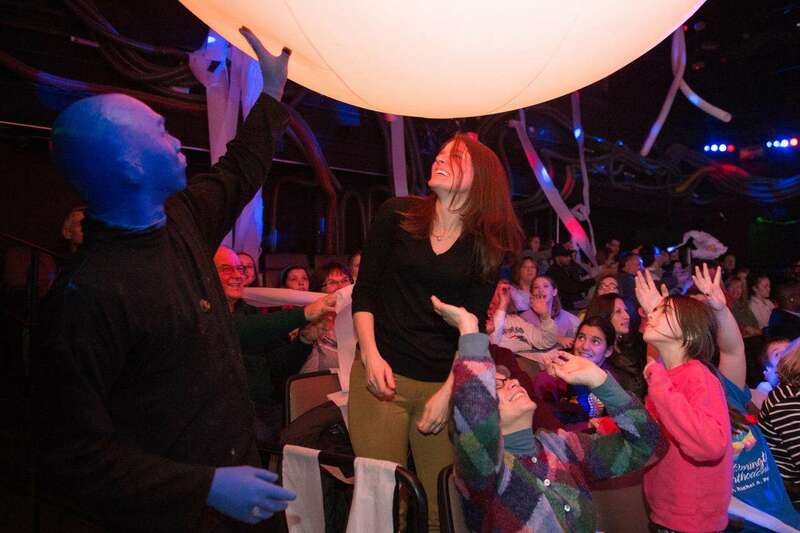 We would like to thank The Blue Man Group for inviting us out to review the show! All the photos from this post were provided by the Blue Man Group in Orlando! Have you ever seen the Blue Man Group at Universal Orlando Resort? If so comment below and let us know what you thought of the show! If not, will you try out the show on your next visit to Orlando? Comment below! Previous Post Clyde & Seamore coming back soon to SeaWorld!